Co-operative movement (кооперація; kooperatsiia). Co-operative associations are based on the ideas of economic co-operation and mutualism. By participating in a co-operative enterprise the members seek either to minimize their costs or to maximize their profits. The main features of co-operative associations are an unrestricted number of members, voluntary membership, equality of rights and obligations, and the election of officers. A co-operative attempts to gain for its enterprise lower interest rates on capital, a fair price for goods and services, and adequate wages. Some co-operatives try to improve the cultural life or the moral and civic virtues of their members. Advocates of the co-operative movement believe that it is capable of gradually overcoming the negative aspects of the present Western socioeconomic system. The Bolsheviks opposed in principle the co-operative movement because, according to them, it distracted the workers from the direct class struggle. Yet, when Vladimir Lenin assumed power, he proposed a co-operative plan by which the state would draw the small farmers, merchants, and entrepreneurs into the building of socialism. Under Soviet rule the state and the Communist Party controled the co-operatives; hence they lacked the essential features that characterize co-operatives in the Western world. The co-operative movement in Western Europe emerged in response to the needs of industrial workers. The Ukrainian co-operative movement, however, emerged in the late 1860s in response to the socioeconomic needs of the recently emancipated peasants and the petty artisans and laborers in the towns. The Ukrainians attributed greater importance to the movement than did most nations. Under the political conditions of the time, it served as a means of social and economic self-defense and became an integral part of the struggle for national independence. The self-governing economic associations not only strengthened the people's economic power and taught the masses civic responsibility, but also trained large numbers of civic leaders, who played a prominent role in the period of Ukrainian statehood in 1917–20 [see Struggle for independence (1917–20)]. Because of different political and legal conditions, the co-operatives developed differently in Russian-ruled central and eastern Ukraine, in Western Ukraine, and under the Soviet regime. Russian-ruled Ukraine. Until 1917 the co-operative movement in this part of Ukraine was closely tied to the movement in Russia. It began in the 1860s: the first consumer co-operative was established by Mykola Ballin in Kharkiv in 1866. The first credit co-operative appeared in Hadiach in 1869, and the second was founded by Hryhorii Galagan in Sokyryntsi in Poltava gubernia in 1871. Up to the 1890s development was slow because of insufficient awareness of the potential of co-operatives among the population and the organizers, the government's hostile attitude to co-operatives, and the lack of co-operative legislation. Thus, the existing co-operatives were weak and often short-lived. In 1880 there were barely 130 co-operatives in Ukraine. By 1895 there were 290; most were credit unions (savings and loan associations), and some (50) were consumer co-operatives. The rural intelligentsia usually helped in founding such unions. Later the zemstvos (particularly their agronomists) were for a long time the main proponents and instructors of cooperatives. After 1904 co-operatives were supported by state inspectors of co-operative credit, zemstvo instructors, and small credit banks. The movement grew more rapidly in the 1890s, owing to a general upsurge in civic life and the enactment of co-operative legislation. The statute on consumer associations issued in 1897 gave local governors (instead of the central government) the power to confirm the statutes of co-operatives. The law on small credit unions of 1 June 1895 (amended in 1904 and 1910) regulated the organization of credit co-operatives. After the Revolution of 1905 the movement developed even more freely. At the time Poltava gubernia, Kyiv gubernia, and Podilia gubernia had more consumer co-operatives than any other gubernias in the Russian Empire. From then on national aspirations, particularly the demand for independent co-operative associations, became increasingly marked in the co-operative movement in Ukraine. The first co-operative associations in Ukraine were the Union of Credit Co-operatives in Berdiansk (1901) and the unions of consumer co-operatives in Kyiv (1908) and Vinnytsia (1910). In 1913 the consumer associations were dissolved, and Ukrainian co-operatives had to join the Moscow Union of Consumer Societies. Through its efforts, the South Russia Consumer Society was established in Kharkiv to carry out imperial centralist policies. The struggle of the Ukrainian co-operatives for their own movement was evident at the all-Russian co-operative congresses: at the first congress, held in Moscow in 1898, Ukrainian delegates agreed to co-operate among themselves in organizing a co-operative movement in Ukraine; at the second congress, held in Kyiv in 1913, which also included Western Ukrainian participants, the delegates raised the question of their right to organize their own associations of co-operatives. In 1913 Kyiv was the center of the Ukrainian co-operative movement. It was the seat of the Nasha Kooperatsiia society, which was the ideological focus of the Ukrainian movement, and the publishing capital of the Ukrainian co-operative press. The following figures show how the movement expanded: there were 450 co-operatives of all types in 1900; 820 in 1905; 2,100 in 1910, and 6,510 in 1914, of which 3,022 were consumer co-operatives (half of them rural, half urban) and 2,477 were credit and savings and loan associations. The most prominent leaders of the movement were Viktor Domanytsky, Osyp Yurkevych, Khrystofor Baranovsky, Borys Martos, Petro Pozharsky, Joachim Wołoszynowski, and Mykola Stasiuk. Agricultural co-operatives (whether farm unions [1,020 in 1915] or farm associations ) and manufacturing co-operatives (founded first by Mykola V. Levytsky at the end of the 19th century as farming artels, which in time became artisan and trades guilds) were less important. Although Ukrainian co-operatives did not succeed in establishing one national independent organization before the Revolution of 1917, they were, along with the zemstvos, an important factor in the economic life of Ukraine. Members of the intelligentsia that founded the co-operatives—Levytsky, Domanytsky, Yurkevych, Oleksander Chernenko, and others—trained co-operative leaders and published the first popular brochures on co-operatives. In 1910 courses on co-operative management, many of which were organized by Martos, began to be offered. During the First World War, even before 1917, the co-operatives expanded their activities. This was particularly true of the consumer co-operatives (owing to food shortages) and manufacturing co-operatives (owing to military requirements). With the outbreak of the Revolution of 1917, the Ukrainian co-operatives began to withdraw from the Russian associations and to form their own. This process coincided with Ukraine's gradual political separation from Russia. 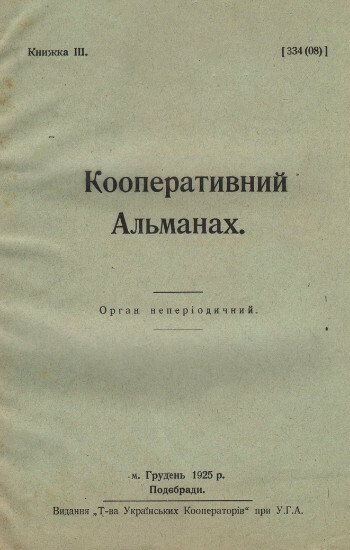 The co-operative legislation adopted by the Russian Provisional Government on 20 March 1917 (after a 10-year struggle for its adoption) facilitated the growth of the co-operative movement. The leaders of the Ukrainian movement wanted to use the co-operative structure as the foundation of the national economy of the new Ukrainian state, which lacked capital. Many Ukrainian political leaders emerged from the ranks of the co-operative movements: half of the members of the General Secretariat of the Central Rada had once been active in the co-operatives. 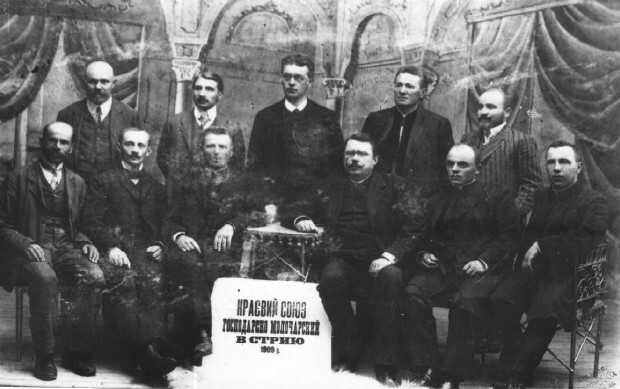 The three all-Ukrainian co-operative congresses—in May and August 1917 and the largest in May 1918—determined the structural forms of the movement and set up the Ukrainian Central Co-operative Committee (Kooptsentr) as the central organization for all of Ukraine's co-operatives. In spite of the war, thousands of different co-operatives appeared: there were 9,200 in 1917 (up from 6,860 in 1915) and 22,300 in 1920. Individual co-operatives joined the numerous new co-operative unions, which numbered 253 by the end of 1918 (compared to a dozen or so before the war). Of these 120 were consumer unions, 43 were credit unions, 7 were farm unions, 41 were mixed unions, and 42 were other unions. The densest network of unions was in Kharkiv gubernia and Podilia gubernia, where most were small and localized. Poltava gubernia, in contrast, had a well-developed network of co-operatives, but only a few unions. At the beginning of 1920 there were 22,000 co-operatives of various types and about 270 unions. There was hardly a locality without a co-operative. The co-operative movement had six million members, and almost 60 percent of the population participated in consumer co-operatives. Besides local and regional co-operatives, there were six all-Ukrainian central specialized co-operative organizations: the Dniprosoiuz central union of consumer co-operatives (council chairman: Borys Martos, executive president: Dmytro Koliukh); the Ukrainbank central union of credit unions (executive president: Khrystofor Baranovsky); the Tsentral union of agricultural co-operatives (council chairman: Kost Matsiievych; executive president: Volodymyr Koval); the Trudosoiuz union of manufacturing co-operatives; the Strakhsoiuz union of insurance co-operatives; and the Knyhospilka union of publishing co-operatives. The latter three were established too late to develop fully. Besides these principal types of co-operatives, other, smaller national central organizations emerged (eg, the building co-operative union Oselia and the cinema co-operative union Ukrainfilm). The entire system was headed by the ideological and organizational center, the Ukrainian Central Co-operative Committee (council chairman: Mykhailo Tuhan-Baranovsky, executive president: Martos). In 1919 three all-Ukrainian unions—Ukrainbank, Dniprosoiuz, and Tsentral—formed the Alliance of Central Ukrainian Co-operative Unions to represent Ukrainian co-operatives abroad and to engage in foreign trade. The idea was only partly successful. Co-operative education developed rapidly. Co-operative schools were set up: the three-year school of the Soiuzbank in Kyiv, known as the School of the Fiftieth Anniversary of Ukrainian Co-operatives; the one-year school of the Dniprosoiuz in Kyiv, known as the Domanytsky School; the one-year Domanytsky School in Zvenyhorod; and so on. Co-operative courses of various types and levels were run almost constantly by county unions. Courses on co-operatives were given at the Kyiv Commercial Institute, the Kyiv Administration Institute, and Kyiv University. The Ukrainian Central Co-operative Committee had a special department for co-operative education and training; in 1919 it established the first advanced co-operative school in the world—the Tuhan-Baranovsky Co-operative Institute, which was reopened in the New Economic Policy period as the Chubar Co-operative Institute. Soviet Ukraine. In the period of War Communism all co-operatives were transformed into consumer communes or unified consumer societies (yedyni spozhyvchi tovarystva or YESTO), which were under the authority of the People's Commissariat of Food Supplies and the quartermaster units of the Red Army. These communes distributed food, primarily in the cities. Membership was compulsory for all workers and public employees until 1924, but all offices were elective, as in regular co-operatives. In certain villages the old Ukrainian co-operatives continued to function. From 1924 on during the New Economic Policy period, co-operatives developed rapidly. In many respects they were similar to the former co-operatives, with elected offices, voluntary membership, competition in the free market, and free enterprise, but at the same time they were instruments of the Party and the state. In the villages the co-operatives became the main economic intermediary between the state and the peasant farmers. The latter could obtain manufactured goods and credits from the state only through them. In the cities the co-operatives became the privileged competitors of private manufacturing and trading enterprises. The state supported the co-operatives, especially in their competition with the kulaks and the nepmen. The co-operatives were the first to receive credits, orders, and supplies from the state and on more favorable terms than did the nepmen or kulaks. Through subsidies the state helped keep the prices of goods sold by co-operatives below market value. The justification for such policies was Vladimir Lenin's co-operative plan, which stated that ‘co-operatives are the road to socialism.’ These policies were in force until 1927–30. In 1925 the consumer co-operatives (organized under the All-Ukrainian Association of Consumer Co-operative Organizations [Vukoopspilka]) were separated from the credit and agricultural co-operatives and became the main, and then the sole, distribution outlets in the countryside for the manufactured goods of state-owned enterprises. The credit unions organized under the Ukrainbank developed considerably, especially in the villages. They provided loans for the purchase of farm implements and equipment, cattle, and housing and also funded various storage and marketing operations. 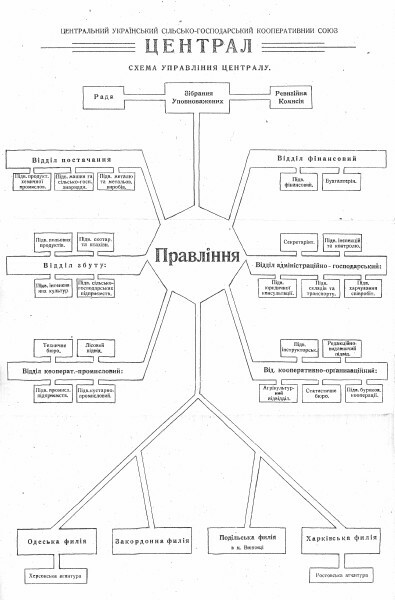 The farm co-operatives organized under the Silskyi Hospodar (Ukrainian SSR) central agricultural co-operative union and certain specialized associations, such as Plodospilka (fruit growers, vintagers, and apiarists), Buriakspilka (sugarbeet growers), Ukrkooptakh (poultry farmers), and Dobrobut (meat and dairy cattle farmers), ran their own marketing and processing enterprises. The manufacturing co-operatives of craftspeople received official encouragement beginning only in April 1925. Until then craftspeople had been regarded as nepmen and non-workers. From then on they were encouraged to join co-operatives and were given preference in providing goods to state-owned enterprises. A new type of cooperative—the housing-construction co-operative—was put in charge of confiscated buildings in the cities (see Housing). The insurance co-operatives were organized under Strakhsoiuz. The central co-operative associations together set up the large Knyhospilka and the smaller Rukh publishing house, Siaivo, and other publishing co-operatives. In 1928 the number of first-level co-operatives reached 41,734 (in 1924 it was 4,725), of which 9,423 were consumer co-operatives, 24,450 were agricultural co-operatives, 4,296 were cottage-industry co-operatives, and 2,417 were housing co-operatives. In addition, the Ukrainbank represented almost 5,800 credit unions. The following changes occurred in the structure of retail trade in the Ukrainian SSR: in 1925–6, 47 percent of the trade was under private control, 39 percent under co-operative control, and 14 percent under state control; in 1928–9, only 18 percent was under private control, while 74 percent was under co-operative control and 8 percent was under state control. In 1929, over 60 percent of the peasantry belonged to one type of co-operative or another. In the New Economic Policy period co-operatives had their own periodicals (see Co-operative press), propagated the idea of co-operation, and conducted a number of co-operative schools. The Chubar Co-operative Institute functioned in Kyiv. Many former co-operative activists returned to the movement and occupied most of the leading positions in it. For this reason the co-operative movement in the Ukrainian SSR was one of the most important sources of national consciousness and was crushed because of its ‘nationalism’ during the terror of the 1930s. The prominent co-operative leaders of the period were Dmytro Koliukh, F. Kryzhanovsky, M. Botvynovsky, V. Hanchel, Pavlo Vysochansky, and Mykhailo Tokarevsky. In 1927 the activities of co-operatives began to be restricted. The co-operatives were increasingly subordinated to state planning and to the People's Commissariat of Trade. Their competition with state enterprises was restricted. Yet the co-operatives in the countryside continued to receive support. All peasants were even pressed to join them, for the government hoped in this way to exact compulsory delivery quotas from them more efficiently. The First Five-Year Plan set various quotas for the co-operatives. In 1930 the government began to set prices on goods manufactured or sold by co-operatives. The right to procure supplies independently fell into abeyance, as co-operatives could not purchase anything outside of the state plan. Similarly, co-operative credit was included in the state financial plan. Furthermore, the co-operatives were heavily taxed: a profits tax and a gross-sales tax, the latter greatly exceeding the tax on state enterprises, were imposed. After 1936 only 20 percent of the profits could be distributed among members. After collectivization the agricultural co-operatives were transformed into a system of collective farms and machine tractor stations. From 1932 on, the specialized co-operative associations began to disappear, and in 1937 the housing co-operatives were abolished. The decline of the co-operatives is evident from the fact that their share of the retail trade dropped from 86 percent in 1930 to 42 percent in 1934 and 29 percent in 1940. At the same time private enterprise collapsed completely, and state enterprise expanded. In the countryside the consumer co-operatives became agencies of the state's trade monopoly. The peasants were forced to obtain manufactured goods only from the co-operatives in exchange for their produce, which was priced very low. This system, with some improvements permitting peasants to buy goods in the cities, is still in force. Most villages still have co-operatives, not state stores. In 1941–4 the Vukoopspilka was restored in the German-occupied territories, while in Soviet-held territories co-operatives declined. It was only the 9 November 1946 decree of the USSR government that again provided a stimulus to the development of consumer and manufacturing co-operatives. It permitted the purchase of raw materials and manufactured goods without ration cards, but at ‘commercial’ prices. Co-operatives organized by invalids received preferential treatment. However, after the monetary reform of 1947 the co-operatives were again strictly subordinated to state planning, and they declined again in the cities. In 1956 the manufacturing co-operatives were abolished, except for the co-operatives of invalids and handicrafts co-operatives. However, the rights of rural consumer co-operatives were expanded. These co-operatives helped the peasants by transporting and selling their private produce in the cities, but thus also limited the initiative and movement of the individual collective farmer. The consumer co-operatives in the Ukrainian SSR were later organized as follows: the lowest units were the village consumer societies, whose members held shares (a minimum share cost 50 rubles). These local societies formed raion consumer associations, which in turn formed oblast associations and then the republican association Ukoopspilka, which wss subordinated to the all-Union association (Tsentrosoiuz) in Moscow. The Ukoopspilka network numbered 56,498 stores in 1956, of which 3,055 dealt in agricultural products, and controlled 31.3 percent of the retail trade. Its membership was close to 10 million in 1959. All offices in the co-operatives were elective, but were under Party control. In 1960 manufacturing co-operatives were abolished, leaving only consumer and housing co-operatives. Western Ukraine. The origins of the Ukrainian co-operative movement in Galicia in the 1870s were connected with the efforts mainly of the clergy to alleviate misery among the peasants by organizing self-help fraternal loan associations, community warehouses, and other enterprises in parishes and communities. From 1891 on the Prosvita society was more successful in organizing stores and loan associations. But only the co-operatives that were founded under the 1873 Austrian law on commercial-trade associations proved to be truly viable. The Narodna Torhovlia consumer co-operative, which was established in 1883 in Lviv by Vasyl Nahirny, was the first of these co-operatives. After amending its charter in 1907, it became a central association of consumer co-operatives of the Rochdale type. Credit unions developed more rapidly, particularly after Teofil Kormosh established a model co-operative called Vira in Peremyshl. In 1898 the first association of credit co-operatives—the Provincial Credit Union—was organized. It became the principal financial institution of the co-operative movement, as well as its highest organizational center. From 1904 the Provincial Audit Union was the auditing center of the Ukrainian co-operative movement in Galicia. It developed into the leading organizational and ideological center of the movement. Agricultural co-operatives began to be organized in 1904, starting with dairy co-operatives founded by Rev Ostap Nyzhankivsky and others in the Stryi region. They formed an association in 1907 known as Maslosoiuz Provincial Dairy Union. In 1899 the Farming and Trading Association was founded in Peremyshl, and in 1911 it merged with the trade syndicate of the Silskyi Hospodar association to form the Provincial Union of Farming and Trading Associations, which in 1924 was renamed Tsentrosoiuz. By 1914 the union had helped to found almost 30 agricultural trade associations in Galicia. The Dnister fire-insurance association, established in 1897, attained a membership of 250,000 by 1914. The people's homes were co-operatives of a mixed type. The Educational Economic Congress, organized by the Prosvita society in 1909 in Lviv, holds an important place in the history of the co-operative movement. Representatives of co-operatives from all parts of Ukraine (except Transcarpathia) attended the congress and adopted a set of common ideological and organizational principles for co-ordinated action. In 1914 the Provincial Audit Union represented 609 co-operatives, 60.9 percent of which were credit unions. In addition, 106 co-operatives belonged to the Russophile Audit Union of Ruthenian Co-operatives in Lviv, and about 400 small credit unions of the Raiffeisen type were supported by the executive branch of the Galician provincial diet. During this period the Raiffeisen credit co-operatives developed in Bukovyna. In 1903 about 150 peasant unions came together to form the association Selianska Kasa. Its leaders were Stepan Smal-Stotsky and Lev Kohut. The co-operative movement in Transcarpathia was weak because a nationally conscious intelligentsia was lacking. The credit co-operatives set up by Edmund Egan were part of the Hungarian co-operative movement. During the First World War and until 1920 the Galician co-operative movement declined; it began to recover only in 1921 after the adoption of the Polish co-operative law in 1920. The co-operative movement developed more vigorously after the Provincial Committee for the Organization of Co-operatives was formed in 1922. Its purpose was to rebuild Galicia's economy with the help of co-operatives. Owing to its initiative, county committees were organized, and these later gave rise to county unions of co-operatives. 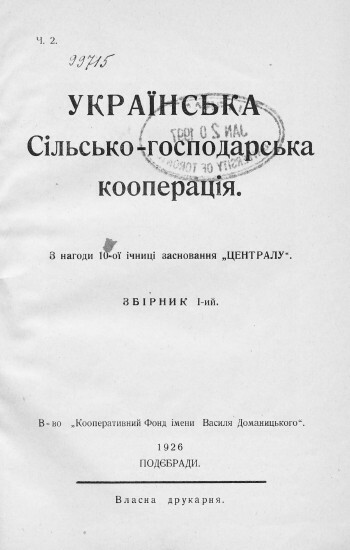 The Provincial Audit Union, which in 1928 adopted the name Audit Union of Ukrainian Co-operatives (RSUK) and was headed by Yuliian Pavlykovsky and Ostap Lutsky, expanded its activity into Volhynia and Polisia. By 1925 it represented 1,029 co-operatives, or almost twice as many as before the war. But financially it was far weaker than before: in 1912 its working capital amounted to 56.5 million zlotys, while in 1925 it was 9.2 million zlotys. By 1934 the union represented 3,193 co-operatives, but a new Polish law adopted that year increased government control over the co-operatives and restricted the union to the three Galician voivodeships, forcing 430 co-operatives in the northwest and the Lemko region to join Polish associations. In 1939 RSUK represented 3,455 co-operatives with a membership of 643,000. The interwar Ukrainian co-operative movement in Galicia consisted of the same types of organizations as before 1914, but now the dominant co-operatives were agricultural, not credit, unions. In 1939 there were 2,360 agricultural co-operatives out of a total of 3,455 co-operatives (ie, 69 percent), organized into 27 county and district unions, which belonged to the central union Tsentrosoiuz. 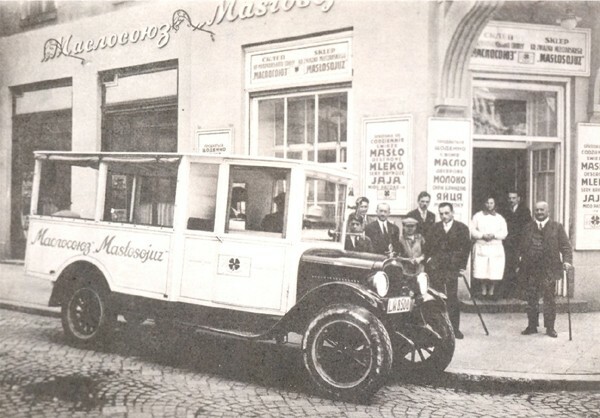 The dairy co-operatives formed 143 regional dairies, all of which belonged to Maslosoiuz Provincial Dairy Union. The network of credit unions, headed by Tsentrobank, included 115 larger city Ukrainbank credit co-operatives, 573 smaller rural banks of the Raiffeisen type, and other co-operatives. The Narodna Torhovlia association had 18 branches and 27 warehouses serving 194 urban consumer co-operatives. There were over 39 co-operatives of other types—manufacturing, health, building, and so on. In 1937–8 the assets of all the co-operatives amounted to 22.9 million zlotys, and the annual turnover was 159 million zlotys. The co-operatives sold 6.8 million zlotys' worth of their own products. About 250 Ukrainian co-operatives in Galicia belonged to the Ruthenian Audit Union in Lviv, and about 600 co-operatives in the northwest and in the western part of the Lemko region belonged to Polish unions. Co-operatives in Volhynia belonged to unions that had head offices in Warsaw and to the regional union Hurt. In 1937 the two Ukrainian audit unions embraced 3,516 co-operatives, or 25.4 percent of all co-operatives in Poland, with 661,000 members, or 22 percent of all members in Poland (while the Ukrainian population of the three east Galician voivodeships in which the two unions operated constituted only 11 percent of the population of Poland). Thus, co-operative membership was proportionally twice as high among Ukrainians as among the population at large. The importance of Ukrainian co-operatives was great, despite the fact that they were much poorer than the Polish co-operatives. In spite of obstacles created by the Polish authorities, such as the Pacification policy of 1930 and the restrictions placed on the Audit Union of Ukrainian Co-operatives in 1934, the Ukrainian co-operatives did much between the wars to alleviate poverty in the overpopulated countryside and to increase the economic power of the Ukrainian population. The Narodna Torhovlia association provided training for co-operative organizers in Galicia as early as the end of the 19th century. Later the Provincial Audit Union and the Audit Union of Ukrainian Co-operatives (RSUK), as well as other central and county unions, organized short courses and correspondence schools. The Commercial School of the Prosvita society, founded in Lviv in 1911, trained co-operative workers and in 1920 was reorganized into the Ridna Shkola society commercial gymnasium. A lower co-operative school was established in Yavoriv, and a school for higher co-operative institutions—the three-year Co-operative Lyceum—was established in Lviv in 1938 by the RSUK. Co-operative education was part of the program of the Prosvita and Ridna Shkola societies. The annual ‘co-operative holiday’ on September 30 was used to promote co-operatives. During the first Soviet occupation of Western Ukraine, the authorities dissolved the Audit Union of Ukrainian Co-operatives (RSUK) and the credit co-operatives. They nationalized the urban consumer co-operatives, but left the reorganized rural consumer co-operatives intact and introduced compulsory industrial co-operatives under Soviet management. The county unions were transformed into raion consumer associations and oblast consumer associations. Together the latter formed part of Ukoopspilka. In the German-occupied western regions of Galicia, which belonged to the Generalgouvernement, there were about 1,000 co-operatives (there had been only 160 before the war), which were organized in 10 county unions and one district union in Sianik. The audit departments of these unions were in Lublin and Cracow. After the Soviet withdrawal the RSUK resumed operations throughout Galicia and represented 4,624 co-operatives. But Ukrainian co-operatives were greatly hampered by the German authorities, who shut down many industrial enterprises and subordinated the co-operatives to various German economic agencies, requiring them to procure agricultural products for the government. After the second Soviet occupation the co-operative system in Galicia came to resemble that of the rest of Soviet Ukraine. In interwar Bukovyna Ukrainian co-operatives disappeared under the Romanian occupation, but they flourished in Czechoslovak-ruled Transcarpathia. In the 1930s the central Provincial Co-operative (Fraternal) Union in Uzhhorod represented over 400 co-operatives, most of which were Ukrainian. The co-operative movement in Transcarpathia gradually acquired a Ukrainian character. Ukrainian co-operative leaders who found themselves in Germany and Austria after the Second World War organized small consumer and manufacturing co-operatives in the displaced persons camps. These were represented by the Uniia association in Munich. In North America the first Ukrainian co-operative was Kalyna Co-operative, founded by Vasyl Topolnytsky in Winnipeg in 1930. The first credit union was established in Saskatoon in 1939 and was named Nova Hromada. By the end of 1977 there were 83 Ukrainian co-operatives (credit unions) outside Ukraine: 39 in Canada, 30 in the United States, 7 in Australia, 3 in Argentina, and 4 in England. Their total membership was 94,670, and their annual turnover was 291.4 million dollars. These co-operatives belong to the World Council of Ukrainian Credit Unions.